Do you have to make a reservation to stay at Finsehytta? You can make a reservation (with full board) if you wish. You do not have to make a reservation. As a part of the DNT organization we welcome all guests. If there are no rooms left, we will use mattresses on the floor. Everyone gets the meals they wish, and a place to sleep. Reception is open between 7:30-22:00 (23:00 in busy days). You send an email with requested date/number of persons to our email. More information: https://finsehytta.dnt.no/booking/. All reservations come with full board: 3-course dinner, breakfast, packed lunch, filling up your thermos and shower. It takes a few days before emails are answered, so its recommended to send it at least some days before arrival. Can you bring dogs to Finsehytta? You can bring your dog. The dogs are staying in cages in our ski-room. If the dog needs blankets etc. you have to bring it with you. The room is inside the cabin, and its heated. You can not bring the dogs to the rooms or reception area. The price for the dogs stay is 100,00 NOK. What activities is possible in Finse? Finse is an excellent place to enjoy the Norwegian mountain nature. In summer season you can hike between the different cabins in the area. You can also do nice daytrips in Finse, to the glacier or on the tops surrounding us. Jøklagutane have guided tours on the glacier in high season. You can rent a bike and go from Finse down to Flåm by the fjords. The nature is spectacular! Remember that summers can be cold in the mountains, take enough clothes with you. Weather changes fast. In winter season you can attend ski sail courses arranged by Finse 1222, or enjoy cross country skiing in the beautiful winter landscape. You can go from cabin to cabin, or do day trips. You can bring bed sheets or sleeping bag liner. We prefer that, and not sleepingbags. If you do not wish to bring your own bed sheets/towels, we sell disposable bed sheets and towels in the reception. There are pillows and blankets in the beds. Do i have to be a member of the DNT? Is it possible to prepare food in Finsehytta? We are a staffed cabin. That means you cant prepare your own food here, as we are serving food. We have no kitchen for guests to make their own food. Do you have any allegies/preferrances(vegan, vegetarian etc.) let us know before you arrive, and we will make something for you. Dinner is served at 19:00 and 21:00 (20:30 on Saturdays), breakfast is served at 8:00-09:00 in weekdays and 7:30-09:00 in weekends. Do you have places for camping? We do not have place for camping around the cabin. 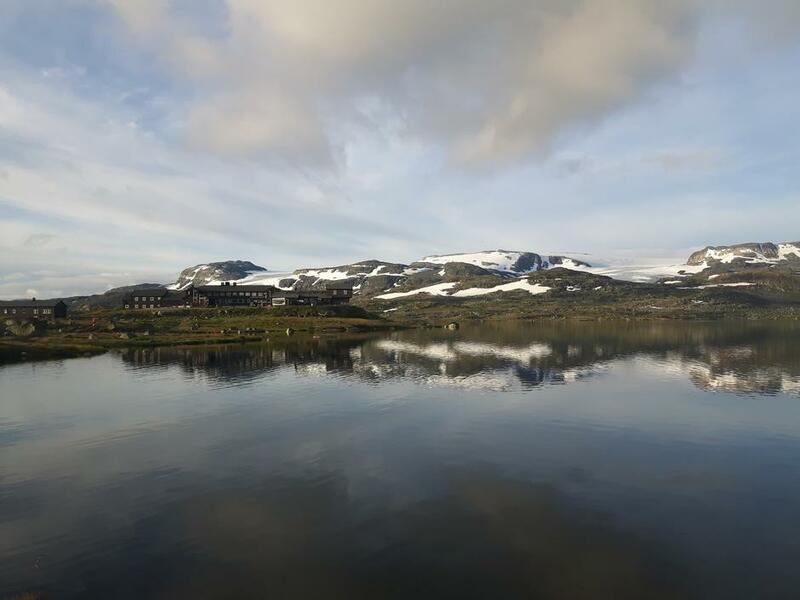 It is restrictions for camping in the sentrum of Finse. You can camp at the south side of the lake for free, there are many nice spots to put up your tent. You are welcome to come and use our facilities.